Western Canada is one of the most preferred destinations among outdoor enthusiasts and nature lovers. The area boasts of expansive national parks consisting of undisturbed ancient forests, rocky mountains, coastal scenery and glacier lakes, among other breathtaking landscapes. If you are planning a beautiful holiday getaway, then you should consider visiting some of the beautiful National Parks in Western Canada. What’s more, these national parks are not as crowded as those on the southern border; hence you get to enjoy a peaceful time with nature, and at times you will be in the wilderness with no cell reception and you may be required to use the services of a tour guide. Let’s look at some of the national parks found in Western Canada. This park is a perfect destination or stop-off point for people driving along the Trans-Canada highway, as it is located near the city of Revelstoke. The park is one of West Canadas smallest National parks, but it has plenty to see. 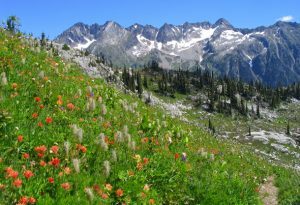 Its ancient forests, deep valleys and colorful wildflower meadows make it popular for hiking, trail running and cycling. During the winter, snow covers the landscape, and activities such as snowshoeing and skiing thrive during this season. Home to the Selkirk Mountains which are older than the Rockies, this park is located between Yoho and Mt. Revelstoke. The Rogers Pass National Historic Site is situated in the park, and the start of the Canadian Pacific railway, which during the 19th century, provided a link between British Columbia and the rest of Canada. The Glacier National Park is also the birthplace of mountain climbing. In 1888, two British explorers scaled the heights of the Selkirk Range, which before then had not been done, leaving the question as to who would want to climb a mountain with no cell reception in modern times. With a total of 42 glaciers, the park is ideal for camping and hiking, and there is a motel known as The Best Western Glacier Park Lodge, ideal for long stays. This National Park sits on the western slopes of the Canadian Rockies, and it’s a haven for outdoor lovers, due to its vast untarnished natural forests. The main attraction is the Wapta Falls, which has been nicknamed the Niagara and is Canadas most beautiful feeder stream. It is important to note that due to the high demand to see it, especially during the peak season, you need to book in advance. Being the first national park in Canada, Banff National Park welcomes close to three million visitors each year. With first-class wildlife, dramatic mountain peaks, and beautiful glacial lakes, its a perfect destination for those who love mountain hiking and camping. If driving along the Icefields Parkway set a date and visit this great park. Copyright © 2019 welcometothewest.ca. All Rights Reserved.